In these days of changing demographics, shrinking attendance, tightened budgets, increased competition, and exponential growth of technology & social media, institutions need to keep their exhibitions fresh, their work relevant, and take bold steps to keep up with the times. To address this statewide need, the New York State Council for the Arts/ Greater Hudson Heritage Network have created the Creativity Incubator , a 2-year pilot partnership program. 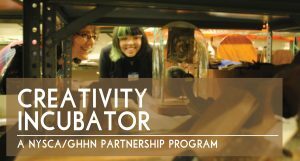 The NYSCA/GHHN Creativity Incubator workshop series invites staff in museums to test out experimental interpretive approaches. As part of this hands-on experience, the host site will have their collections or permanent installations re-imagined by creative thinkers in the field and session participants. The Creativity Incubator workshop series will be led by the Museum Mavericks, some of the most creative thinkers in the field today. In the afternoon session, participants will explore the chosen site’s collections, discovering the amazing stories they hold and creating new ones. The end goal of the program is to open our eyes to the possibilities and encourage museums to think more imaginatively about the interpretation of their collections and the visitor experience. The Creativity Incubator began in 2017 in the Hudson Valley, Long Island and the Mohawk Valley. Nine sites participated in a social media contest to determine the three host sites – this competition led to an impressive 6,828 individual votes – mobilizing thousands of community members to vie for this program to land in their favorite museum. One workshop was held in each of the regions to a sold out crowd of museum professionals around the state! Now the Creativity Incubator is heading to Western New York! The next NYSCA/GHHN Creativity Incubator workshop will be held on Tuesday, May 1 and it could be held here in Geneva. The Geneva Historical Society is one of seven finalists for the workshop location. If we win, the workshop will be held at the Geneva History Museum and our collections and permenant exhibits will be re-interpreted. If we come in second or third place we can send one staff member to the workshop for free. 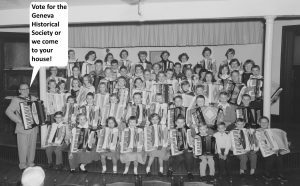 Other finalists are the Herschell Carrousel Factory Museum, North Tonawanda; Roger Tory Peterson Institute of Natural History, Jamestown; The Cobblestone Society & Museum, Albion; Theodore Roosevelt Inaugural Site, Buffalo; Memorial Art Gallery, Rochester and Regina A. Quick Center for the Arts at St. Bonaventure University, St. Bonaventure. Help us by voting and spreading the word. Anyone with internet access can vote but people may only vote once from a specific device during the voting period. However, a person could vote on their smartphone, tablet, and computer. The poll ends on April 1. The Creativity Incubator, a NYSCA/GHHN Partnership Program, is made possible with funds from the New York State Council on the Arts, with the support of Governor Andrew M. Cuomo and the New York State Legislature.